Whether you have an indoor or outdoor cat, you can provide many benefits for your feline friend, including safety, enrichment, fresh air and the stimulation of nature, by building a catio. 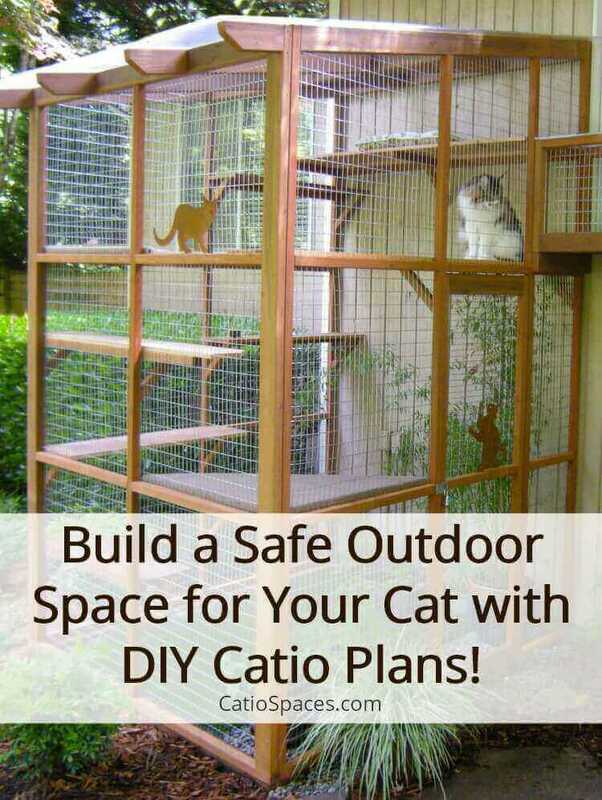 Catios are cat enclosures or “cat patios” that provide peace of mind knowing your cat is always safe outdoors while protecting birds and wildlife. Cat Access: The ideal location for a catio is near an exterior window or door with easy access for your cat to enter directly into a catio. Cat doors, available in a variety of sizes and styles, can be installed in a window, door or a wall. If you prefer a catio located further away from your home, consider a cat tunnel or carrying your cat to the catio. Size: Evaluate how much outdoor space you have available and how many cats will use the catio. Cats love vertical space so you can maximize a small area by adding several vertical shelves and perches. 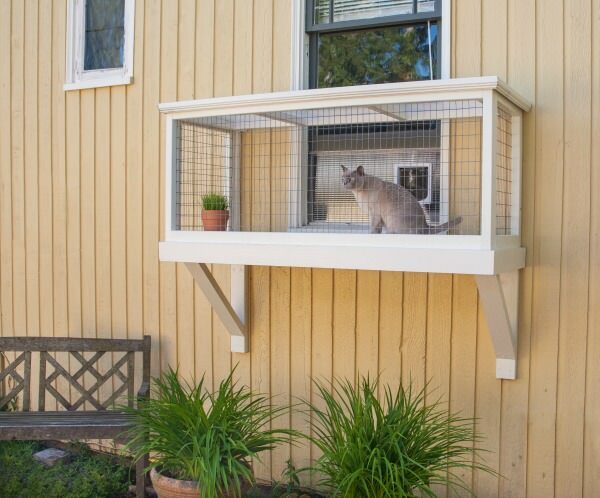 If space is limited, a window box catio is a great option. If you want to enjoy the catio too, a 6’x8’ or 8’x10’ size catio will allow space for seating and bonding with your cat. After all, nature is good for humans too! Level Foundation: Build your catio on a flat, level foundation to insure a successful project. Uneven ground can be leveled or you can build your catio on a patio or deck. Above-ground window box catios can be supported by angle braces that attach to the house. Sun/Shade: Cats love basking in the sun so a location that offers both sun and shade is ideal. Always provide shade for your cat such as shade cloth, a bench or cat shelter while outdoors. Stimulating Views: Cats need stimulation on a daily basis. A catio location with views of a garden, wildlife and family activities will provide endless enrichment for your cat while enjoying fresh air. Wire: To insure your cat’s safety and the durability of a catio, 16 gauge, galvanized welded wire (fencing wire) is recommended and available in a variety of sizes including 2”x3” or smaller. Other options include vinyl-coated wire in green and black colors. Wire can be attached to your wood framing using a staple gun. Floor: If you build a catio on a deck or patio, your floor surface already exists. For catios built on the ground, consider existing grass or add bricks, pavers or decking material. These materials will help avoid tracking dirt or muddy paws into your home. 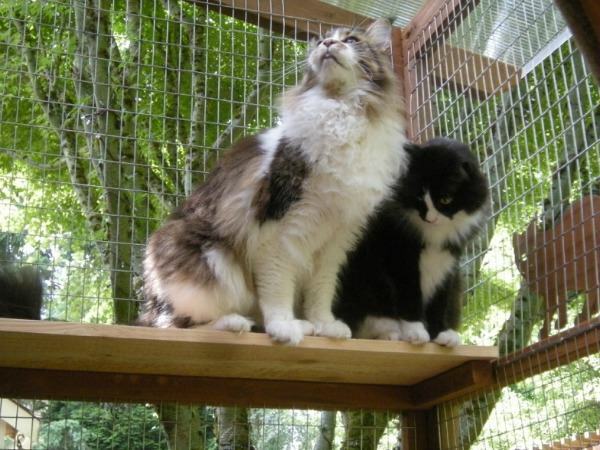 Cedar shelves: Tight-knot cedar is a good choice for creating shelves for vertical and horizontal movement in the catio. Corner perches, ideal for lounging and catnaps, can be constructed using ¾” exterior grade plywood and covered in outdoor carpet. Roof: A wire mesh or a clear, polycarbonate covered roof will insure your cat is contained and protected. Cat Toys and Cat Scratchers: Add your cat’s favorite toys, a cat scratcher, tunnel tube or other enrichment for your cat’s enjoyment. Cat Safe Plants: To keep your cat healthy, avoid using plants that are toxic to cats. Several safe plant choices include wheat grass, catnip, basil, nasturtiums, pansies or grass planted in a pot. Litter Box: An outdoor litter box (in addition to your indoor box) can help reduce indoor odors and provide a convenient location for your cat’s needs while outdoors. Decorate! 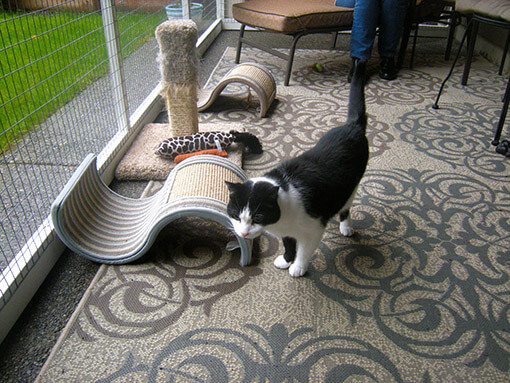 Have fun decorating your catio with rugs, seating, garden art and more. 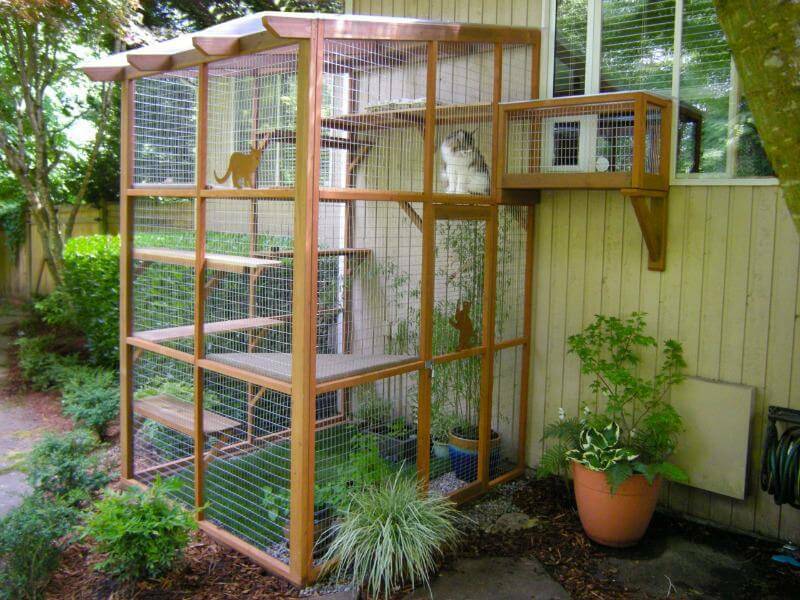 There are endless ways to customize your catio to suit your style and your feline’s fancy! A DIY catio plan can be the easiest way to build a catio and to get it right the first time. As the founder of Catio Spaces, we’ve been building custom catios for cat guardians for several years and while each catio is designed for a specific location, I’ve found that a few styles work well for most homes. I’m passionate about catios and want to help every cat have a catio of their own. That’s why I made my most popular catio designs available to take the guesswork out of building one. 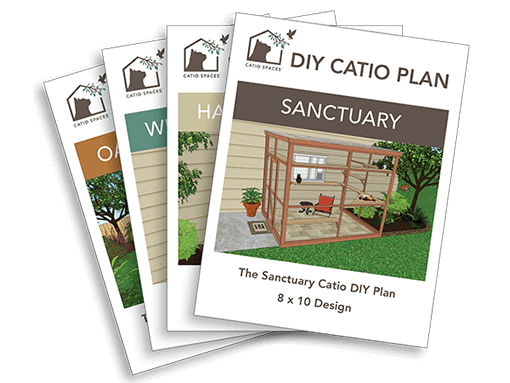 Our DIY catio plans are designed to be built as panels (for ease of assembly) and best of all, you don’t need to be an experienced carpenter! Which Catio Design Should I Choose? 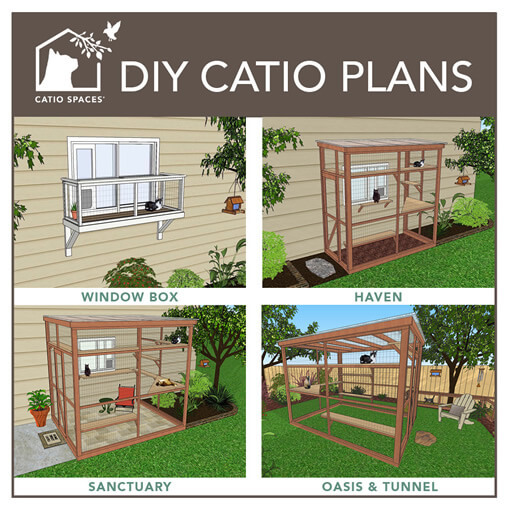 Catio Spaces offers a variety of DIY catio plans for a window, patio, deck, garden or yard. If your space is limited, consider our compact Window Box™ or Haven™ catio plans. 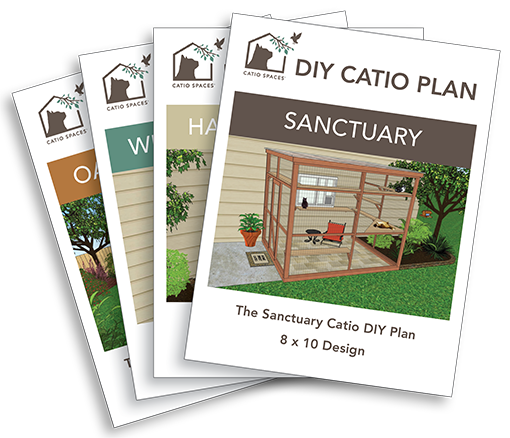 For a catio you can enjoy too, the Sanctuary™ and Oasis™ plans are a purrfect choice with space for human seating. If you want to locate the cat enclosure away from your home, the Oasis™ includes instructions for building a catwalk tunnel that connects your home for 24/7 cat access. What’s included in a DIY Catio plan? Instructions for installing a wire mesh roof or a clear, polycarbonate weatherproof roof. Shelf designs to maximize vertical space for cat exercise and enjoyment. It’s easy to build a catio! Whether your catio is small and simple or large and luxurious, you’ll enjoy peace of mind knowing your cat is always in a safe environment while enjoying the outdoors. And your cat will give you a “paws up” for building it!